At the Paxton Pottery we run many classes and workshops for all ages. We welcome those who are starting their pottery journey and those and who wish to continue learning. We also hold workshops for groups and offer pottery painting for your creative celebration. Our courses, workshops and parties take place on a Monday, Tuesday Evening and Saturday and Sunday afternoons. Private sessions can be arranged to suit your event, workshop or party. This structured course is designed to give beginners a rounded experience of pottery and the several techniques we use to create ceramic pieces. Over six weeks you will learn how to create and decorate set of tiles, a lidded box, a bowl, a vase, various pinch pots and glaze sample pieces, You will be introduced to the art of hand building, Wheel throwing, applying glazes, design and leave with a love of ceramics. For those that are experienced in pottery and can work independently. 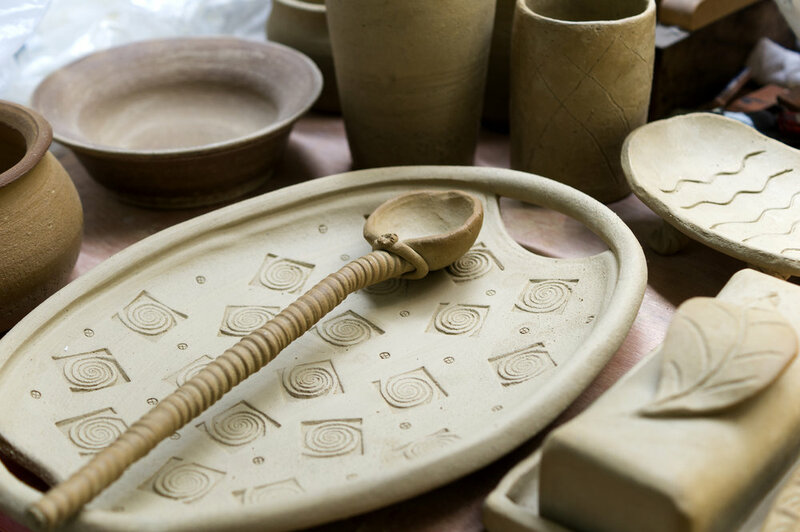 The pottery equipment for your use includes two throwing wheels, clay, decorating resources and materials. The glazes available are dipping, underglaze, coloured slips, oxides, speciality and coloured recycled stained glass. £25 per hour pay as you go all materials and firing included. Get in touch to book. We hold creative parties for you celebration suitable for children and adults. We offer pottery painting on to bisque pieces including mugs, plates, trinket boxes or a theme of your choice. Parties take place Saturday or Sunday and after school midweek sessions. We can also provide a buffet for your food and drink needs. Talk to us about booking your unique party. Want a creative activity for your hen party, baby shower or birthday? We run workshops for you to create ceramic trinket boxes, mementos, tile plaques and more. Party organisers can receive a framed set of small tiles made by your friends and family. I have been working with pottery in South East London for 15 years and I love the permanence and fragility of ceramics. Clay allows us to express our ideas alongside design. The wide range of clays, glazes and techniques still excites me now as when I first discovered pottery. I training in the craft was provided by Adult Education and I gained a City and Guilds certificate in Design for Craft and Ceramics plus teaching qualifications. I have worked on many school and community ceramics arts projects and sell my own pottery. The Paxton Centre was set up as a community creative hub in Aug 2016. Here I was able to house on a permanent basis locally created art and craft which originated from my collaborative craft stall in the Crystal Palace Food Market in SE19 called 'Handmade Palace'. The vibrant arts space is also an outlet for others to sell their work, run workshops and classes as well as providing meeting and networking opportunities. The centre is named after the original 'Paxton Arms Hotel', a beautiful building which served as a pub for 150 years and now runs under the ethos of building friendships, skill sharing and promoting a local economy while celebrating all things local.